(Nanowerk News) Researchers at the University of California, Riverside have found parts produced by some commercial 3D printers are toxic to certain fish embryos. Their results have raised questions about how to dispose of parts and waste materials from 3D printers. "These 3D printers are like tiny factories in a box," said William Grover, an assistant professor of bioengineering in the Bourns College of Engineering. "We regulate factories. We would never bring one into our home. Yet, we are starting to bring these 3D printers into our homes like they are toasters." The researchers studied two common types of 3D printers: one that melts plastic to build a part, and another that uses light to turn a liquid into a solid part. They found that parts from both types of printers were measurably toxic to zebrafish embryos, and parts from the liquid-based printer were the most toxic. They also developed a simple post-printing treatment - exposure to ultraviolet light - that reduced the toxicity of parts from the liquid-based printer. The research comes as the popularity of 3D printers is soaring. The value of the 3D printing market grew from $288 million in 2012 to $2.5 billion in 2013 and is projected to grow to $16.2 billion by 2018, according to a report by Canalys. And, as the price of 3D printers continues to drop -printers that use melted plastic are currently available for as little as $200, and the liquid-based printer used in this study can be bought for less than $3,000 - they are moving beyond industry and research labs to homes and small businesses. The research started about a year ago when Grover bought a 3D printer for his lab. Shirin Mesbah Oskui, a graduate student in Grover's lab, is developing tools for studying zebrafish embryos, and she wanted to use the printer in her research. However, her plans were thwarted when she noticed that zebrafish embryos die after exposure to parts from the 3D printer. From those observations, Oskui and Grover then decided to test the toxicity of printed objects from the two types of 3D printers. 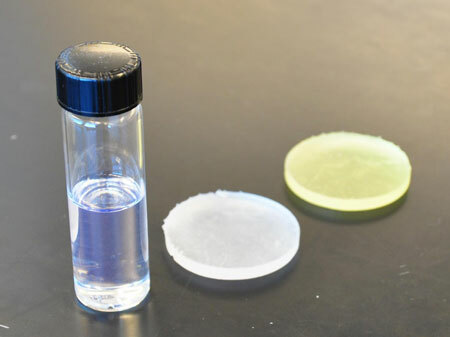 Their results are described in a paper published online today (Nov. 4) in the journal Environmental Science and Technology Letters ("Assessing and Reducing the Toxicity of 3D-Printed Parts"). Joining Oskui and Grover as authors on the paper are Jay Gan and Daniel Schlenk, professors in the Department of Environmental Sciences; Graciel Diamante, a graduate student working with Schlenk; and Chunyang Liao and Wei Shi, both of whom work in Gan's lab. Oskui used two commercial 3D printers in their study, a Dimension Elite printer made by Stratasys (which uses melted plastic to build parts) and a Form 1+ stereolithography printer made by Formlabs (which uses liquid resin to make parts). She used each printer to create disc-shaped parts, about an inch in diameter. Then she placed the discs in petri dishes with zebrafish embryos and studied survival rates and hatch rates and monitored for developmental abnormalities. While the embryos exposed to parts from the plastic-melting printer had slightly decreased average survival rates compared to control embryos, the embryos exposed to parts from the liquid-resin printer had significantly decreased survival rates, with more than half of the embryos dead by day three and all dead by day seven. And of the few zebrafish embryos that hatched after exposure to parts from the liquid-resin printer, 100 percent of the hatchlings had developmental abnormalities. Oskui also investigated methods for reducing the toxicity of parts from the liquid-resin printer. She found that after exposing the parts to ultraviolet light for one hour, the parts are significantly less toxic to zebrafish embryos. The UC Riverside Office of Technology Commercialization has filed a patent for this work. The researchers' findings call attention to regulations related to the materials used to create 3D printed parts. The substances used to create the 3D-printed parts would be regulated by the Toxic Substances Control Act, which is administered by the Environmental Protection Agency. But the precise identity of these substances is often unknown to researchers and printer users because the printer manufacturers don't disclose this information. In the future, the researchers plan to further study the toxicity of the components of the 3D printer material both individually and when mixed together in a completed part. They also want to find out at what level the material could be harmful to humans. Other unanswered questions include how to dispose of the waste material - both solid and liquid - created by 3D printers. At this point, the researchers think it is best to take it to a hazardous waste center. "Many people, including myself, are excited about 3D printing," Grover said. "But, we really need to take a step back and ask how safe are these materials?"